Rumors are flying that astronomers at the European Southern Observatory have discovered an Earth-like exoplanet in the habitable zone of Proxima Centauri, our nearest neighboring star. If confirmed, this is undeniably one of the biggest astronomical discoveries of the century. And here’s the really mind-boggling part: we might actually be able to visit Proxima Centauri within a generation, thanks to Yuri Milner’s Breakthrough Starshot initiative. An ESO spokesperson told Gizmodo he can make no comment on the rumor at present. According to Der Spiegel’s unnamed informant, the ESO will make a formal announcement about the planet at the end of the month. Gizmodo has received independent confirmation that an announcement will take place next week. 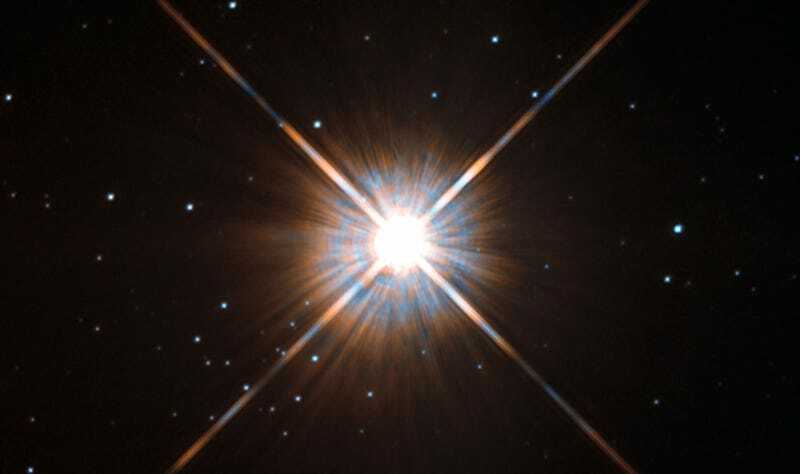 Proxima Centauri is a small red dwarf star located just 4.25 light years away, slightly closer to Earth than the famous binary pair of Alpha Centauri A and B. (It is actually believed to be gravitationally bound to Alpha Centauri, making the system a trinary.) Smaller and fainter than our sun, red dwarfs comprise roughly 80 percent of all stars in the Milky Way, although we don’t see them when we look up into the sky at night. Recent exoplanet survey campaigns have revealed these dim bulbs to be rife with rocky, super Earth-sized planets in the not-too-hot, not-too-cold habitable zone where liquid water can form. So in a sense, the possible discovery of a second Earth around Proxima Centauri isn’t all that surprising. On the other hand, it’s exciting as hell. For one, such a world would become our prime candidate for the next generation of detailed exoplanet surveys that begins with the launch of the James Webb Space Telescope (JWST) in 2018. With JWST’s unprecedented seeing power, astronomers will finally be able to catch faint dips in starlight as it passes through the atmosphere of a distant world. By doing so, we’ll be able to decode atmospheric chemistry from afar, determining whether a planet is breathable and habitable. We may even be able to tell if it supports life today. Whatever we learn, it’ll go a tremendous way toward our understanding of red dwarf systems in general, and the likelihood for life to emerge throughout the galaxy. Then, there’s the prospect of actually visiting, which would sound like complete science fiction if it weren’t for the fact that Stephen Hawking and Russian billionaire Yuri Milner recently proposed we do exactly that. Through his Breakthrough Starshot initiative, Milner is putting $100 million into the development of lightweight, laser-propelled nanocrafts that can travel at up to 20 percent the speed of light, meaning they’d reach the Alpha Centauri system within 20 years. We’ve got a long way to go before the first interstellar nano-voyagers are ready to set sail, but the technology that will get us there is already well underway. What would life be like on a world orbiting Proxima Centauri? The habitability of red dwarfs has been a matter of considerable debate and science fictional speculation for decades, with many astronomers questioning the premise that these stars can host life at all. Because red dwarfs are much cooler than the sun, the “habitable zone” is very close in. In all likelihood, the planet in question would be in a tighter orbit than Mercury, its dim red star engulfing an enormous swath of the sky. The planet would be prone to an increased rate of solar flares, and it could become tidally locked, resulting in a permanent day and night side and some pretty wild climate dynamics. Of course, we shouldn’t get ahead of ourselves too much—the planet in question remains an unconfirmed rumor for now. Even if it does exist, much more work will be needed to figure out what things are like on the surface. But one way or another, it seems the answers are coming soon.